James Schamus is 56 — a little late, you might think, to start a career as a director. But as a long-time screenwriter (Crouching Tiger, Hidden Dragon), producer (Brokeback Mountain), and savvy film executive who championed such talents as Ang Lee, Todd Haynes and the Coen brothers, Schamus knows his way around the business and the art of movies. 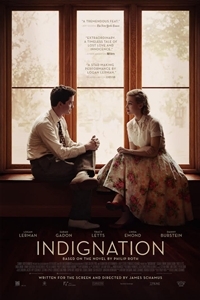 With Indignation, his fierce, feeling adaptation of Philip Roth’s 2008 novel, Schamus kicks off a new phase in his career with impressive finesse. When he wrote the novel, Roth was looking back at his own life in 1951 as a New Jersey student who left the Newark campus of Rutgers University for Bucknell College in Pennsylvania, mostly to avoid being drafted to fight in Korea. Both Roth and Schamus approach youthful rebellion through the prism of maturity. And the film resonates from that perspective.